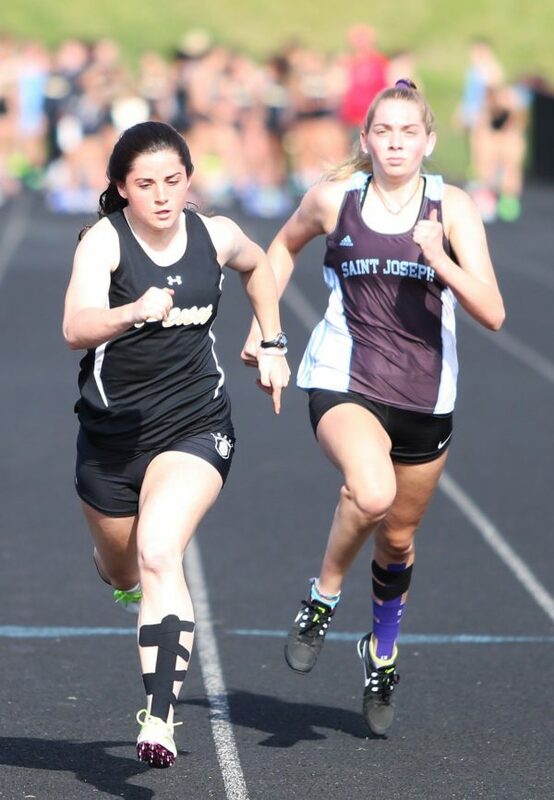 The Penn Girls Track Team took on Northern Indiana Conference opponents Mishawaka and Clay Colonials in their outdoor season opener on Tuesday, April 9, 2019. Despite some outstanding individual performances, Penn came up short to Mishawaka. The final score was Mishawaka 89, Penn 70, South Bend Clay 5. Julie Smith took 1st in the 400 meter dash with a time of 1:02.43. Nicole Marshall took 2nd place. Kelsi Carrico won the 300 meter hurdles with a time of 49.69. Trinity Clinton won shot put with a throw of 35-4.5. Grace Ditmer won pole vault with a jump of 8-6. Molly Pooler, Hannah Cussen, Mackenzie Holland, and Nicole Marshall won the 4×800 relay. Maya Lacognato took 2nd in the 200-meter dash. Brooke Neal took 2nd in the 1600-meter run. Kayla Edgerly took 2nd in the 3200-meter run.